It falls under a class of algorithms called greedy algorithms which find the local optimum in the hopes of finding a global optimum. We start from the edges with the lowest weight and keep adding edges until we we reach our goal. Take the edge with the lowest weight and add it to the spanning tree. If adding the edge created a cycle, then reject this edge. Keep adding edges until we reach all vertices. 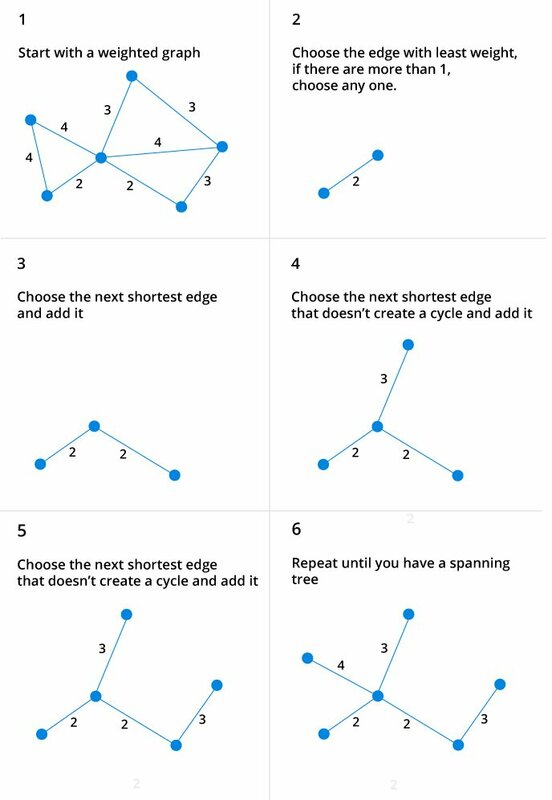 Any minimum spanning tree algorithm revolves around checking if adding an edge creates a loop or not. The most common way to find this out is an algorithm called Union FInd. The Union-Find algorithm divides the vertices into clusters and allows us to check if two vertices belong to the same cluster or not and hence decide whether adding an edge creates a cycle. Here is the code for C++ implementation in C++. We use standard template libraries to make our work easier and code cleaner. cout << T[i].second.first << " - " << T[i].second.second << " : "
Prim's algorithm is another popular minimum spanning tree algorithm that uses a different logic to find the MST of a graph. Instead of starting from an edge, Prim's algorithm starts from a vertex and keeps adding lowest-weight edges which aren't in the tree, until all vertices have been covered.